A basic stuffing, onions, celery with bread cubes. Make as usual with a bit of the Bell’s seasonings and wet with stock. Of course you could use a prepared stuffing mix. A family member brought home some surplus bread, too much to consume before it would go stale, so I processed it into bread crumbs by broiling the slices, and processing in the food processor to different textures. A sliced chicken breast, just some salt and pepper with addition course bread crumbs. A few ingredients for a meal, frozen shrimp available and some veggies with noodles from a soup kit, less the seasoning package. You can get an idea of cooking times from the time date stamps on the pictures. With the abundance of fresh veggies and with the addition of noodles, lo mein was an easy choice, though prep would be essential to the recipe. A slicing of the veggies was done using the rotary slicer of the kitchen aid attachment. One of those recipes, the more you look the more variations you find , you settle as with most “authentic” recipes to the ingredients you have available to the village or are grown locally. I didn’t get to list all the sauce ingredients and amounts, but loosely followed several recipes that I researched by listing all the ingredients that compose the sauce to get an idea of the basics. I modified it by adding a bit more cornstarch and a good amount of stock as I prefer s saucy-er thick coating to the dish. The sauce was a build up from the basic soy sauce/rice wine/sugar combo. Some of the associated components are: soy sauce, rice wine, fish sauce, shrimp paste, chili paste, ginger root, galangal root, garlic, sugar, honey, salt and pepper with sesame oil. The sauce, less the stock. The veggies are the same deal, use what you have. Pea pods and the baby bok choy were included as they were fresh and attractive from the market. The carrot was also crunchy as they were fresh, large diameter and not very tapered as the packaged carrots were. Stir fry the veggies in oil. While stir frying the veggies, prep the noodles, I used rice noodles instead of the wheat noodles, so just a brief toss in hot water is all that’s needed, drain and add to wok. Mix well , then add the sauce… serve…. The result is as good or better result than restaurant because you have control of the ingredients. So if you like salad with noodles with a sauce here it is. I made this dish twice and this post is a compilation of the pictures from both. It was time to put away all the spices and herbs and return to a simple beef stew. Usually a fall seasonal dish but any break in the high temps and the availability of beef and beef broth made this an easy choice. 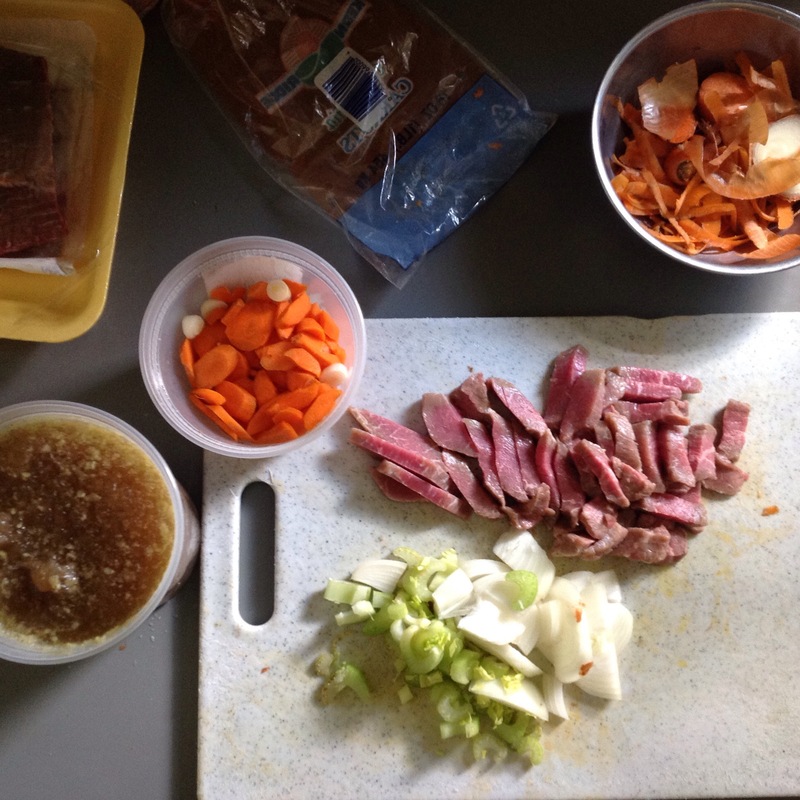 Beef, carrot, onion, celery and potato, common ingredients. Lucky to have some beef broth which I had made previously and froze. now in the same pan saute the veggies. I scrubbed and diced some white potato, and microwaved them slightly, then added to the stew. Some reserved broth was mixed with rice powder and added to thicken stew. Simmer till the potatoes are done to your preference. Salt and pepper to balance. Nothing fancy here, beef flavor. Perhaps some bread to mop up gravy. One of the starts of a day, potato salad for breakfast? Well now that I am at the age of expansion (not by size 😌) of blogging and cooking skills, more time to plan the start of the day since this day does not require to work for the clock, so to speak. Sit in the yard outside in the cool morning. Breezing through the WordPress reader with the trusty cup of coffee and Diane also came to sit outside for some time and enjoy the late summer morning air. A reliance on social media and connectivity for inspiration, catching up on the news both local and global, Hmmm… this recipe look like something that would give me some first day nourishment. With the ingredients on hand, it was an easy, savory dish ! Sweat the onions and celery…. NOTE: I added a bit more sugar to the dressing, the apple cider vinegar used was of the home-made variety so it was a bit more pungent. Finish by mixing in the dressing…. serve warm. NOTE: if mobile device is below 20 % battery, then photostream won’t sync, once on charger though it works. Celery, leeks, onion, garlic, parsley, tomato, potatoes, that had been cooked for 1 and one half hours, processed in a blender and strained. It’s a healthy food recipe called Special Soup or Hippocrates Soup, it’s a good tasting nourishing soup alone or as utilized as a base for other recipes. Beef chuck , diced to small size suitable for soup. Olive oil, bacon fat etc. in the pan. Fry the beef, till almost fully cooked. Diced onion, roughly 1/2 as much as the beef. Salt, pepper and seasonings to taste. One or two medium tomatoes, diced chunky. Finish with finely chopped garlic, cook till the ingredients are wilted. Meanwhile in a oven proof measuring cup, mix a measured amount of quick cooking barley and water as package directs. Microwave several minutes, drain, and add to soup. I needed some greens in the soup for color , my wife suggested some baby spinach . The spinach was added and then seasonings adjusted and grated Parmesan added for the finish. Everything was warmed through. A very tasty and nourishing soup a recipe worth repeating. A mild fall day, meat and vegetables made for the week. A combination of meats along with root vegetables oven roasted several hours. Chicken breast, pork neck bones, pigs feet , chicken feet, beef rib, sausage, along with root vegetables. Carrot, leeks, turnip, parsnips, onions, mushrooms, potato, garlic. Lightly seasoned with Hawaiian sea salt , peppercorns, slight bit of hot pepper flakes. Baked at about 350 decreasing to 250 degrees for several hours. The meat picked from the bones, pan juices reduced, chicken broth added, a bit of wine and finished with butter/flour thickening, strained.